Restore the film to the continuity of the shooting script. The members of the FanEdit community. Edited using Sony Movie Studio Platinum 13.0. 00:00:00 - 00:29:51 No significant change. 00:29:51 - 00:31:28 Fade in on scene set in Van Helsing's lab. 00:31:28 - 00:32:45 Fade in on gate to Seward's sanitarium, followed by scene in Renfield's room with Renfield and Martin. 00:32:45 - 00:36:24 Fade in on scene set in Seward's office. 00:36:24 - 00:52:21 Fade in on Mina recounting her dream and subsequent scenes. Deleted repeated footage of Dracula rising from box at Carfax Abbey. 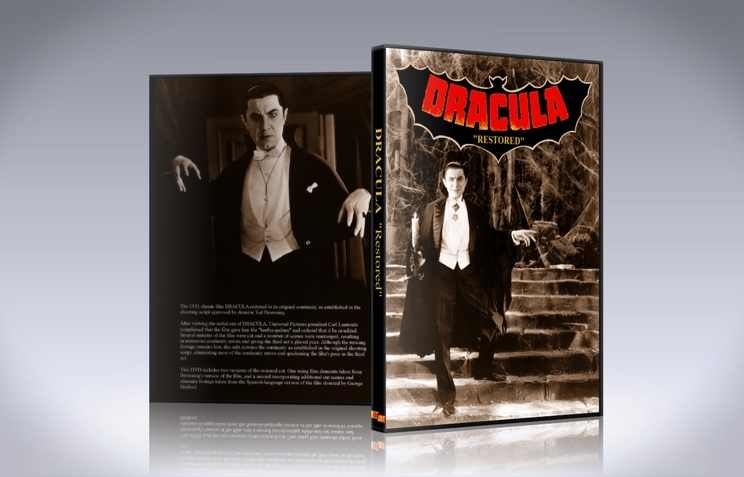 00:52:21 - 00:53:19 Cut to scene set in Renfield's room where Dracula appears outside window. 00:53:19 - 00:55:13 Van Helsing, Harker, and Seward in library, joined by Renfield. Seward calls Martin to tell him Renfield has escaped again. 00:55:13 - 00:56:28 Dracula's first visit to Mina's bedroom, included portions of later scene where Dracula hypnotizes nurse, deleted repeated footage of bat at window. 00:56:28 - 00:59:05 Van Helsing, Harker, Seward, Renfield in library. Others leave as Dracula confronts Van Helsing. 00:59:05 - 01:00:57 Harker visits Mina upstairs on terrace. 01:00:57 - 01:02:48 Conclusion of Dracula's confrontation with Van Helsing in library. 01:02:48 - 01:13:56 Conclusion of scene upstairs on terrace, Dracula's second visit to Mina's bedroom (slightly reworked to disguise missing footage used to support Dracula's first visit to Mina's bedroom), chase to Carfax Abbey and dispatch of Dracula. Great work. It's easy to dismiss Lugosi's performance because it's been parodied throughout the years, but I've always felt that he was incredible in the role - it's just hard to remember that since everything about his Dracula has become a cliche. But when we forget those preconceptions, and simply watch his performance and take it for what it is, I think he does amazing work. Of course, the problem's always been the film which carried his performance. It's difficult to sit through, because of two reasons - its play-like pacing and the jumbled continuity of the second half of the film. This edit does much to mend the first and almost entirely fixes the second. The movie feels more like a film and - dare I say it - makes sense. Parts of the film, particularly later, are a still a bit slow, but certainly not to the point of taking the joy out of watching it. Renfield's character makes so much more sense, and I'm able to enjoy his maniacal presence much more. I can't speak for the dead (or the undead for that matter) but I suspect that Browning would have appreciated this effort. I think Billy Batson has given us the best version we can possibly get out of this film. I do have two suggestions that go beyond the bounds of the original film(s). The first is to address the issue of Lucy. We can infer the Van Helsing will kill her; however, I had an idea that I thought might work. At the very end, where Mina and Harker go up the spiral staircase while the bells ring before it fades out, maybe the editor could add words on the screen explicitly revealing her fate: "The vampire Lucy Weston was found and destroyed by Professor Van Helsing. 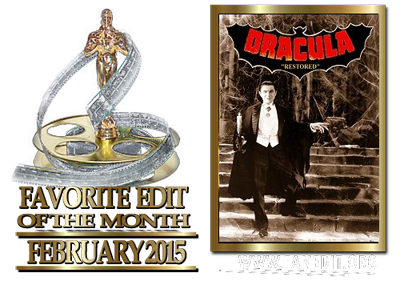 The fate of Dracula's wives remains unknown." I think that might really work. And it would add an unsettling somberness to an otherwise happy resolution. My second suggestion is one I'm not even too sure about: sampling other parts of Swan Lake in other scenes scenes in the film. I'm not suggesting that a score for the film from Swan Lake be created - but perhaps a few notes here and there might quicken the pace during moments when the film is slow. Then again, perhaps it's best that there is no music. Between the Swan Lake opening and the church bells at the end, I don't believe there's any music in the film, and this has a symbolic significance (music is dead while Dracula 'lives'). Also, silence adds a lot to the eeriness of Dracula. To close, let me commend the editor once again. They say a film is 'written' three times - when it is written, when it is directed, and when it is edited. Editing can save or destroy a film - editing saved the original Star Wars film, turning a bad movie into a good one. The reverse is true for Dracula. Studio editing ruined Browning's story, but I'm happy to now have a version which restores that tale. I suspect that even the original was far from a great movie, but this re-edit strongly suggests to me that it was at least a good one, and I'm happy to be able to finally enjoy it. I watched the non-purist cut of this (blu-ray) which contained elements from both versions of the film, and I honestly couldn't discern which shots didn't belong to the original. The entire thing is masterfully done and vastly superior to the theatrical release. I didn't notice anything awry audio-wise and, apart from some overly quick fades (which others have also noted), visual editing was excellent as well. The narrative is much improved, although, due to lost footage, it can never be perfect. The story isn't massively well told and I can't imagine it making a great deal of sense to those who aren't familiar with the book. Still, this is probably it at the best it can be, and the pacing is also so much better as a result of the re-ordering of scenes and minor trims. Does this replace the original for me? Probably. I'm still yet to watch through the Spanish language version and I'd also like to see the theatrical once more so that I can give the alternative soundtrack a proper spin. But off the top my head - yeah... this is it. Really well done, and clearly with a great deal of respect for the source material. Highly recommended. What's so divine about this edit is that Kristen Stewart has been removed almost entirely. Unfortunately, all the Kate Beckinsale scenes were excised, which should make the People for the Ethical Treatment of Werewolves rather happy, I guess. The scenes were reordered so that Van Helsing comes off as an even greater know-it-all badass, in that he clearly foresees the production of Blacula. Great work, Billy Batson! I've never been too crazy for this Dracula, but this is now my definitive version. 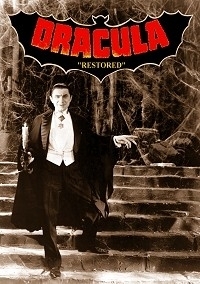 Old and creaky, the 1931 Dracula bears more cobwebs than Carfax Abbey. It never really escaped its West End production roots. Lugosi’s riveting count more than compensated, as did terrific photography by Freund, and outstanding set design which set the template, still resonating in Horror films to this day. The second half of the movie is deadly slow, however. To quicken the pace, Billy Batson rearranged scenes slightly and added material from the Mexican version of the film. Video - This is the nicest, sharpest version of this film I have seen. Superior to my laserdisc and DVD circa 1999. Credit excellent source material and attentive editing. Deft work here, though I noticed a repeated scene (56.25 - 1:07.15) where Mina removes her wolfbane necklace. Audio - As to be expected, mono mix. Sound level extremely low, and I wish Billy would have amplified this. Not a complaint, not an issue. All dialogue was clear, just had to boost it. No Glass score, by the way, or any other track. Narrative - No substantial change here. Second half of the film still moves slower than the first, but the pace is no longer glacial. Scene modifications definitely helped. Enjoyment - I did enjoy this, and I appreciate what Billy Batson did, but this will not bump my DVD off the shelf. Rather, I burned a copy and sleeved it in the keepcase. A great alternative to the classic version.